CAPE CANAVERAL, Florida -- As the prospect of lunar missions made by commercial spacecraft and foreign nations comes closer to a reality with the passing of each day, a bill titled "Apollo Lunar Landing Legacy Act" was introduced into the U.S. House of Representatives that would designate the U.S. lunar landing sites created between 1969 and 1972 during the Apollo 11, 12, 14, 15, 16, and 17 missions as Historical Parks that would fall under the administration of the U.S. National Park System. Additionally, H.R. 2617 would seek international recognition of the landing sites through the United Nations Education, Scientific, and Cultural Organization (UNESCO) with a "World Heritage Site" designation. The bill, which was sponsored by U.S. Representative Donna Edwards (MD-4) and co-sponsored by U.S. Representative Eddie Johnson (TX-30), was referred to the Committee on Science, Space, and Technology, and the Committee on Natural Resources for review. In 2011, NASA issued a detailed publication titled: "NASA’s Recommendations to Space-Faring Entities: How to Protect and Preserve the Historic and Scientific Value of U.S. Government Lunar Artifacts" which laid out recommendations to future lunar missions where not to go, or disturb, prior U.S. Lunar Mission sites. Although NASA advises that the document is a recommendation and does not "represent mandatory U.S. or international requirements," the publication is full of citations to both U.S. law and international treaties. 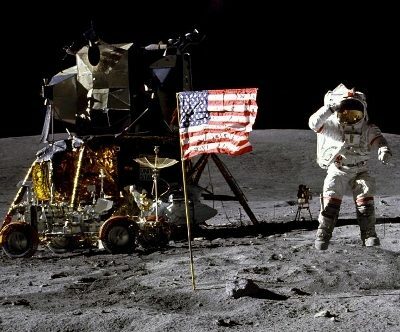 While the lack of an ongoing U.S. manned space flight program makes many Americans cringe, the prospect of a hostile nation in the future wiping out any evidence of the U.S. lunar landings in an effort to re-write history becomes unfathomable. "NASA recognizes the steadily increasing technical capabilities of space-faring commercial entities and nations throughout the world, and further recognizes that many are on the verge of landing spacecraft on the surface of the moon. In the 50 years since the first lunar missions, the spaceflight community has not formally provided recommendations to the next generation of lunar explorers on how to preserve the original artifacts and protect ongoing science from the potentially damaging effects of nearby landers. Until more formal guidance is developed – perhaps through a multilateral approach – NASA has assembled this document that contains the collected technical knowledge of its personnel. External experts from the historic, scientific and flight-planning communities have reviewed these technical recommendations for lunar vehicle design and mission planning teams. This document does not represent mandatory U.S. or international requirements; rather, it is offered to inform lunar spacecraft mission planners interested in helping preserve and protect lunar historic artifacts and potential science opportunities for future missions. Specific indicators of U.S. human, human-robotic lunar presence, including footprints, rover tracks, etc., although not all anthropogenic indicators are protected as identified in the recommendations. Because of the relevance of these recommendations to current and future lunar elements deposited by other space-faring entities, NASA has engaged in dialogue with commercial and international space agencies to share the document and open the discussions for improvements to the recommendations." The 93-page publication detailing each U.S. lunar site can be found here.